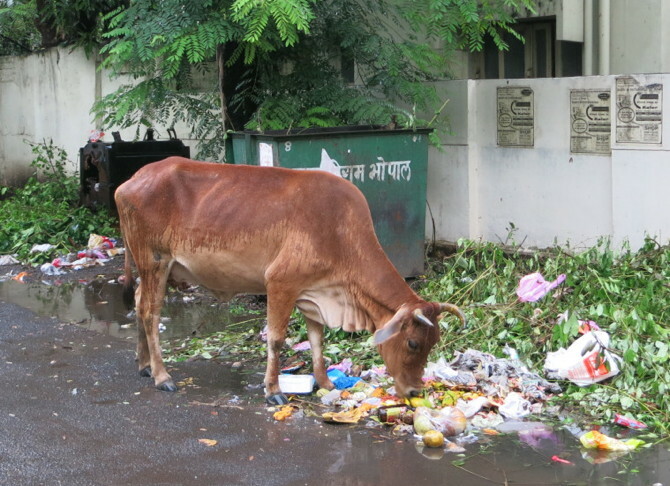 I just walked by a cow eating mangoes from a garbage heap. I’m definitely not in Kansas anymore. After a night in the swanky but labyrinthal Delhi Airport hotel and a quick but turbulent morning flight, I walked out of the plane, into the rain and onto a bus. We taxied over to the Bhopal airport terminal, where met Pradeep and his wife Shibani for the first time. It was only 22 degrees out. Lovely weather. They drove me (in their Continental style car – with the wheel on the opposite side) through Bhopal, showing me its many faces. It is the City of Lakes, the state capital (meaning it has government buildings and an enormous governor’s residence) and so very green. Monsoon season means everything is alive and growing. What struck me was all the colour; the irregularity of the houses, the winding streets, people in bright clothing hurtling along on motorbikes. I had been expecting to be thrown off by the chaos but I wasn’t. And I am sure it is partly a function of being removed from the city’s bustle, safe in a car with people I knew and trusted, but I also think that Bhopal might be a Goldilocks type city – large enough to be interesting, but small enough to have a face you can see all at once. Kind of like Hamilton in that sense – though I admit that a twenty-minute exposure isn’t enough to decide much of anything. Suffice it to say that I immediately felt attached to the place. The constant honking didn’t even seem that abrasive. Pradeep admitted to me that the whole goal of my trip, at least for him, is to make me not want to leave Bhopal. He was kidding, folks, don’t worry. We arrived at my place of residence for the next month, the ground floor apartment of Pradeep & Shibani’s friend. I admired the metal wires on the windows (there is a word for this that I am forgetting) and the beautiful front garden. The accommodations are simple; “We Indians are all about functionality, not really appearances,” admitted my host, Mrs. M. No matter, they will be great for me. Still nauseous and woozy from travelling, I ate a simple breakfast of fresh papaya (wow!) and bread. I unpacked and then headed upstairs to get better acquainted with my human and canine hosts. I met Jhangi (spelling that wrong, and I can’t even pronounce it right, yet), an Indian version of Boomer. A Lab, he’s a little tubbier (he has a weakness for mangoes) but shares in the traits of laziness and friendliness. The other dogs are all small and white. They enjoyed trying to bite my hands in what I hope was a playful manner. There were also three week old puppies that Mrs. M was feeding milk because their mother didn’t have enough. “We’re animal people here!” The “we” refers to her daughter, A. (I’m not using their full names because I still have to ask them about blogging), who is 22 and pursuing a Master’s in Child Development. She has an entrance exam soon and so has been studying up on her English. A. and I had a chat about wanting to be what you are not – about skin whitening creams in India, plastic surgery and tanning in the West. She took me on a walk around the neighbourhood, where I saw my first Bhopali cow. Walking with her (and avoiding the honking motorbikes that drove by us), it finally hit me that this all wasn’t a dream and that I was in a very different place. I saw a garbage heap with cows and stray dogs and people picking through them. Pradeep and Shibani let me settle into my accomodations, then came to pick me up for lunch. We drove to the college where their children, Piyuli and Pyiush, had just started school. It was literally their first day of classes. Combining the celebrations of me coming and them starting, we went to Taste of India, a restaurant run by a friend of Pradeep’s from school. (He is also named Pradeep. This is very important information, I know.) I had tali (several vegetarian dishes) and practiced eating with my hand. It’s a skill I still have to perfect, but I’ll have many opportunities here, I’m sure. They took me back to my flat and set up my (surprisingly beautiful) mosquito net for me. After they left, I tried to relax without sleeping, which was moderately successful, until fell asleep! I woke up a few hours later at 8:30 p.m., feeling like I could still sleep the whole night. The Ghoshes (Pradeep, Shibani & co) had offered to have me over at their place for dinner at 9, but I cancelled last minute. I felt pretty bad about it, but that feeling was outweighed by tiredness. I tucked in my mosquito net and finally went to sleep, listening to the rain outside my window.